Earth is filled with Life, Yes. But what exactly is "Life?" And what forms of Life have nervous systems? Here we give a brief primer on this active scientific arena. In this write-up you will read about the organization of living beings and the types of nervous systems therein. How did Life arise de novo on Earth? These three questions have challenged scientists and thinkers since civilization began, but we have made progress in answering questions one and two . Question three remains the unknown of unknowns . We tackle question one here: what is Life? 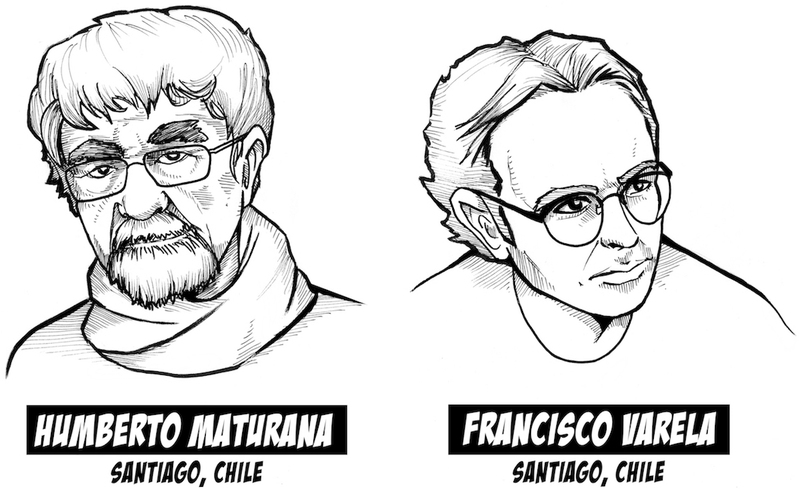 In the 1970's, Chilean scientists Humberto Maturana and Francisco Varela wrote of 4 properties common to all living systems in their influential philosophical work "Autopoiesis: On Machines and Living Things." All life systems consist of separation, be it cells or viruses, of an inside environment and an outside environment, typically using hydrocarbon "micelles" than can spontaneously form in solutions . A living system also consists of cycles between chemical components: metabolic activity among proteins, amino acids, fats, sugars, etc. Life begets more life, given its ability for reproduction. Life has behavior - it seeks conditions ideal for its own existence. If Life is hungry, Life eats. If Life is cold, Life seeks warmth. If Life is damaged, Life self-repairs. aryotes) have nuclei, organelles like mitochondria and chloroplasts, and are themselves further classed into various groups such as the single-celled "protist" forms, the intermediate forms (single cells that can form colonies), and the true multicellular forms like us. It is to these multicellular eukaryotic forms that we direct our attention. 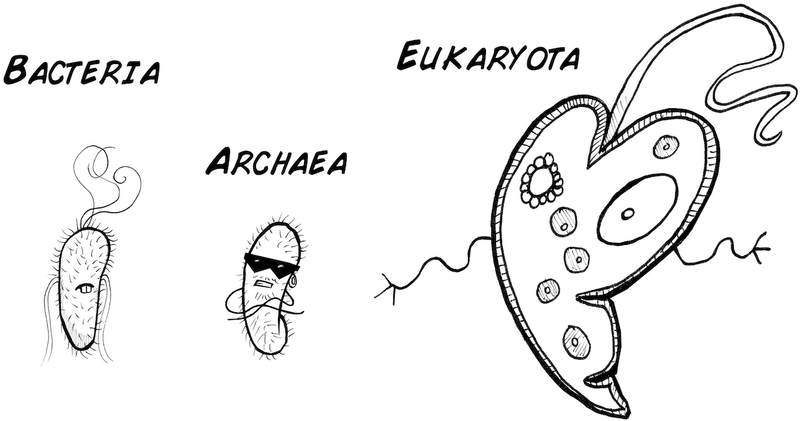 Broadly speaking, there are three types of multicellular life . First, we have the plants. Wonderful multicellular lifeforms that use the energy of the sun to grow and make their own food. We also have the fungi, which are multicellular life forms that eat other things to grow. Molds and mushrooms, for example, eat through absorption. Some fungi can also be single-celled, like the yeast in your bread. And finally, we have the animals. But what is an animal? When you open your traditional biology textbooks, five things are typically spoken of, two of which are actually not particularly important for classifying animals. 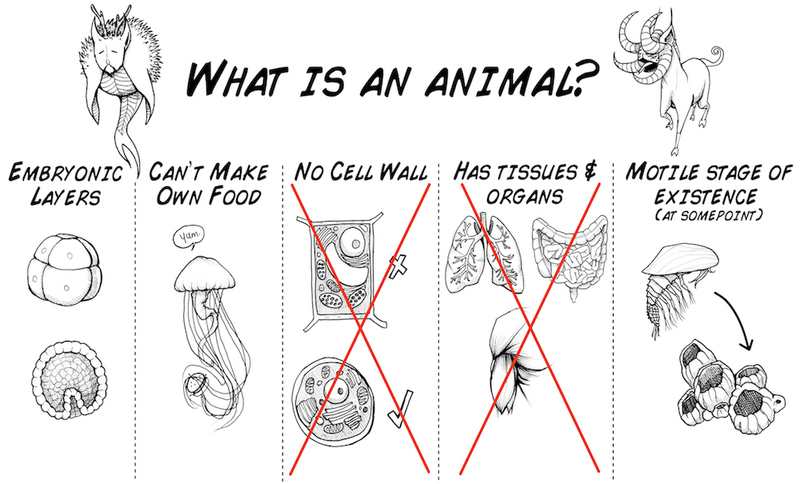 So, you may ask, what really is an animal? Here we present the most reduced form. What does a nervous system then do? It is a computational and communicative system of specialized cells to quickly detect the environment, analyze it, and move the body in an appropriate manner and time. 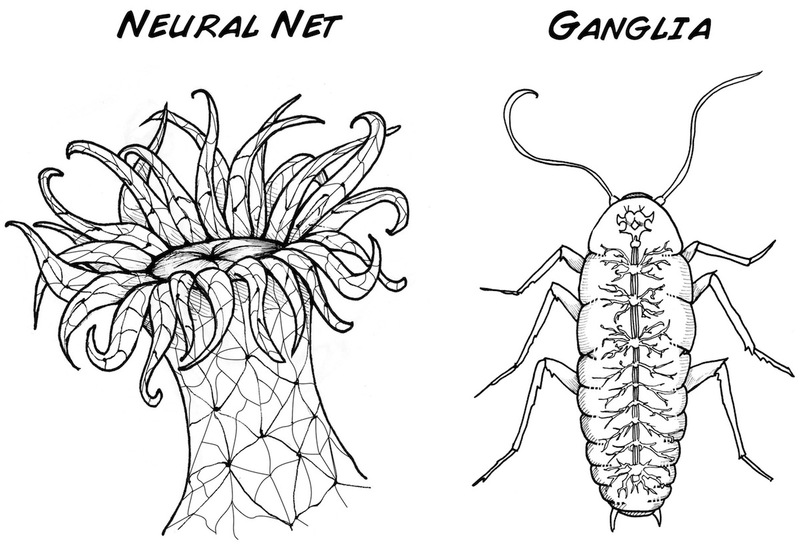 To do this, nervous systems have in general two principles of design: Neural Nets and Ganglia. 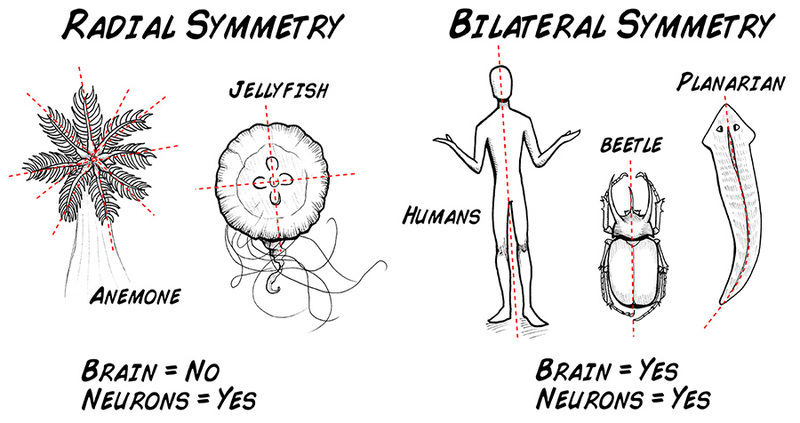 A rule of thumb is that animals with radial symmetry (Jellyfish, Anemones, Hydra) have neural nets, which is a general distribution of neurons throughout body. Animals with bilateral symmetry (insects, worms, us), however, have collections of neurons grouped together in ganglia, often with an enlarged ganglia in the anterior part of the animal called a "brain." As Neural Nets are found only in fragile, difficult to study, soft-body marine creatures, we know very little about how they function. All our knowledge of nervous system physiology comes from bilateral animals with ganglia-based nervous systems. 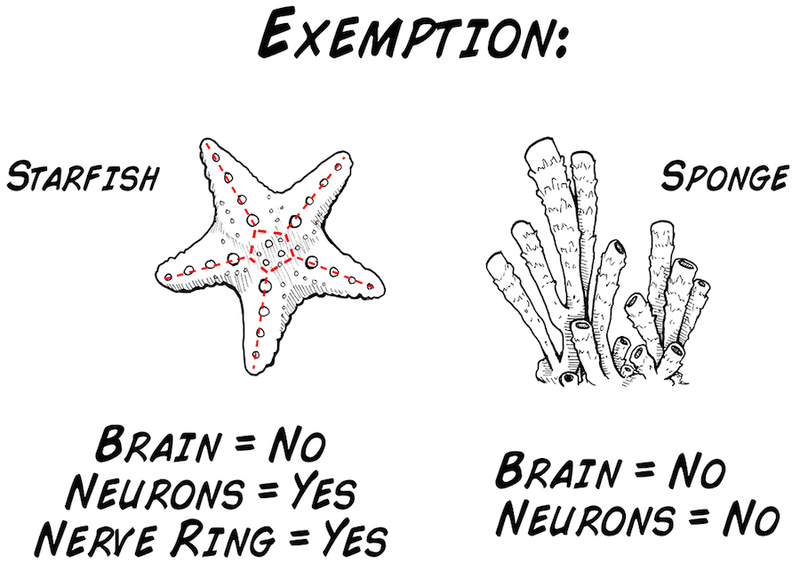 But as biology is famous for, there are exceptions to nervous system organization. A sea star has radial symmetry but does not have a neural net; it has a type of ganglia called a "nerve ring." And not all animals have nervous systems- specifically the two most basal animals: porifera (sponges) and placazoa (the tricoplax). All other animals though, be it jellyfish, clams, crustaceans, insects, fish, lizards, birds, mammals, and of course we humans, have nervous systems. We can further organize nervous systems between bilateral animals that are vertebrate versus invertebrate. Vertebrates have a spinal cord encased in a bony spinal column and consist of the birds, amphibians, lizards, fish, and mammals (yep, those five are it). Invertebrates, a much larger and more diverse group, lack spinal columns, can be soft bodied or have exoskeletons, and consist of effectively every other type of animal (worms, insects, mollusks, crustaceans. etc). 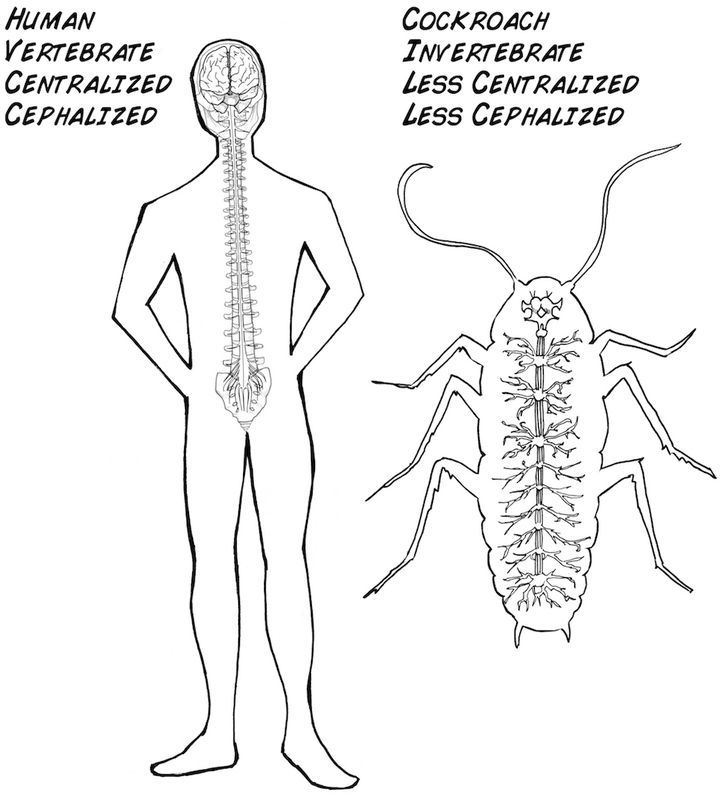 A notable difference between vertebrate nervous systems and invertebrate nervous systems is the "degree of centralization." A cockroach, for example, has ganglia spread along along its nerve cord and a slightly larger ganglion in its head (its brain). This ganglia (brain) is much more enlarged in vertebrates, and the ganglia of the nerve cord (spinal cord) are smaller relative to the body. And in general, the larger the organism, the more neurons it has. Where did the Neuron come from? Due to morphology and genetic studies, the neuron is thought to have only evolved once from a universal common ancestor, unlike eyes (6-7 times) or wings (4 times - pterodactyls, birds, insects, and bats). What creature then had the first nervous system? When did the 'first neuron' with electrical signaling appear? The simplest nervous systems are thought to be the nerve nets of the "Cnidaria" group, which includes anemones, hydra, and jellyfish. Clues may lie in these creatures. 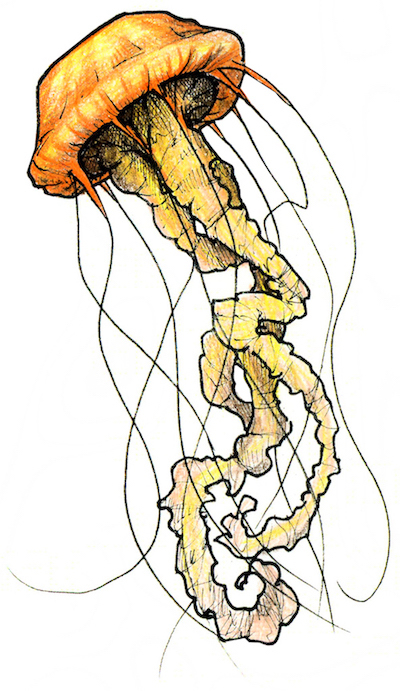 The neuron only evolving once is now up for debate due to the recent genetic sequencing of comb jellies (Ctenophora). Comb jellies are sometimes popularly considered jellyfish but are a completely different type of marine creature. Notably, they are the largest life forms that swim with cilia along their bodies (like super size protists). The genetic studies have revealed that comb jellies have ion channels in their neurons that are distinct from all other animals' ion channels. Perhaps it developed neurons independently. New information becomes available every year. Thus we leave you for now with the revelation that comparative neuroanatomy and physiology is an area rich for discoveries. How the nervous systems of jellyfish and anemones operate is virtually untouched. 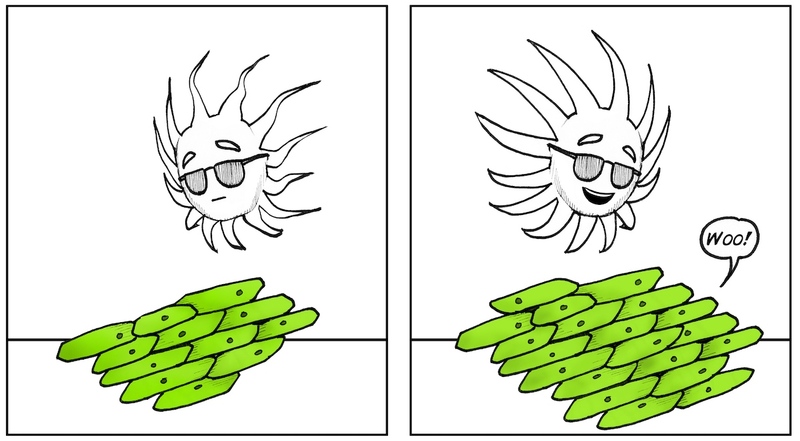 How neural nets function is unknown. 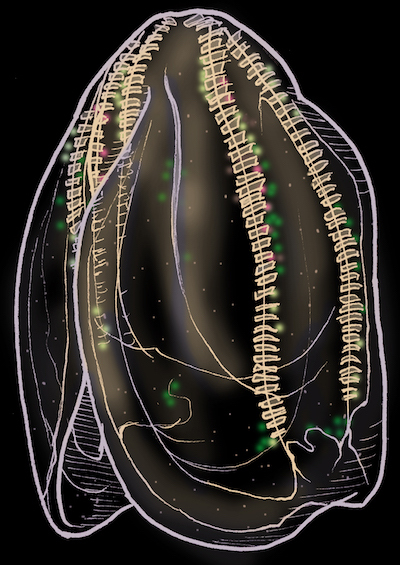 And the secrets into the first nervous systems may be guarded by the comb jellies.....we await the unveiling. You can read about the famous experiments of Miller-Urey if you are curious into the question of abiogenesis and how living systems systems can emerge from primordial terrestrial chemistry. Planet-Hunter Astronomers are trying to identify ""habitable zone" planets that contain spectral evidence of water, considered a universal solvent of life. The sub-surface sea on Jupiter's moon Europa also is an intriguing candidate, as well as the strange "hydrocarbon" oceans on Saturn's moon Titan. Prions and isolated DNA fragments not withstanding. Biology Nerds - we know that the different types of multicellular algae (brown, green, red, etc) are classed into their own individual families - but to simplify things we leave them out for now and speak of only Plants, Fungus, and Animals. How starfish have radial symmetry but yet contain ganglia is due to their ancestors. Reading about their classification will reveal why. Hint: They are more related to bilateral animals. Robots that can self assemble is an active research topic. What do you think would be required for a robot to be considered alive? As stated before, we know very little how neural nets function, but this is beginning to change. 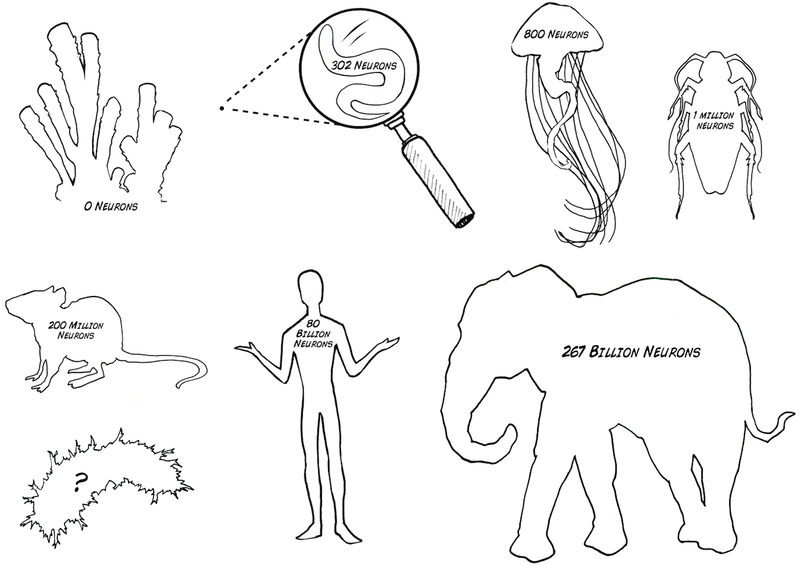 "Back to Basics: Cnidarians Start to Fire" (paywall) by Rafael Yuste and colleagues, summarizes emerging studies of creatures with neural nets and where we are. We thank an anonymous visitor to our Detroit Maker Faire stand way back in 2010. When we said: "All animals have nervous systems," he responded with "What is an animal then?" We realized we did not have a satisfactory answer and were ignorant. We also thank Biologist Daniela Flores of the Chilean Science outreach group MicroMundo for advising us on comparative biology and classification. Biology by Neil Campbell - Our go-to general biology reference. You can find previous editions usually very cheaply or free at used bookstores or libraries.